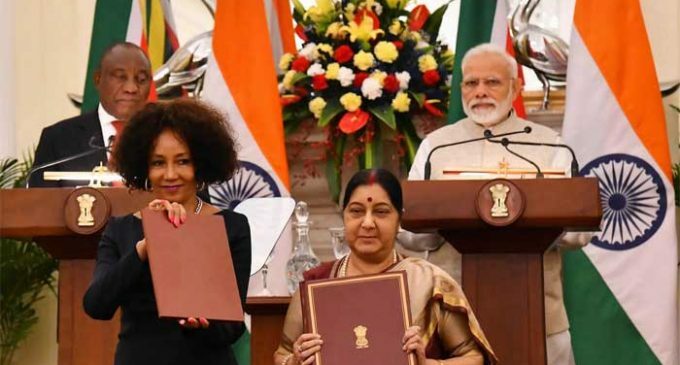 New Delhi, Jan 25 (IANS) India and South Africa on Friday signed an agreement to further deepen their Strategic Partnership, including in political, economic and defence spheres, following delegation-level talks led by Prime Minister Narendra Modi and South African President Cyril Ramaphosa here. The Three-Year Strategic Programme of Cooperation is aimed at enhancing the Strategic Partnership Agreement that was signed in 1997 by Prime Minister H.D. Deva Gowda and South African President Nelson Mandela in 1997. According to a joint statement issued after the meeting, both sides “emphasised the need to further deepen relations in the political, economic, defense, scientific, consular and socio-cultural spheres”. In a joint address to the media with Ramaphosa following the talks, Modi said that both sides reviewed the entire gamut of their bilateral ties. “Our trade and investment ties are becoming more and more intense,” he said. Modi said that Indian companies are contributing to President Ramphosa’s efforts to increase investments in South Africa. According to the joint statement, both sides welcomed the significant investment and presence of a large number of Indian companies and business entities in South Africa and the growing number of South African investments in India. The two sides also agreed to cooperate, share best practices, technology and expertise on the ease of doing business reform programme. The statement also said that both sides agreed that the two countries should explore solutions aimed at boosting trade and investment. “In this context, President Ramaphosa agreed to simplify and reform South African business visa regime,” it stated. Stating that India is a partner in South Africa’s efforts in skill development, Modi, in his address to the media, said that a Gandhi-Mandela Skills Institute will soon be opened in Pretoria. “We are both committed to take our relationship to a new level,” he said. The Prime Minister said that both India and South Africa are strategically located in the Indian Ocean region. According to the joint statement, both sides recognised the importance of increased bilateral naval cooperation and closer synergy within the context of Indian Ocean Naval Symposium (IONS) which, by keeping the sea lanes secure against illegal actors, will ensure unhindered passage for trade and continued prosperity of the entire Indian Ocean region. It also stated that the two sides agreed to enhance cooperation in the field of the oceans economy and to cooperate in multilateral forums on the Blue Economy including within the framework of Indian Ocean Rim Association (IORA). Modi also said said both countries are pluralistic democracies that are carrying forward the legacies of Mahatma Gandhi and Nelson Mandela. “As such, both countries share a similar broad global outlook,” Modi said. Modi also said that both countries are working together to bring about reforms in the UN Security Council. On his part, Ramaphosa said that that India is a strategic partner for South Africa. “PM Modi and I were in agreement that considerable scope exists for growing and expanding our bilateral ties, especially economic ties,” he said.